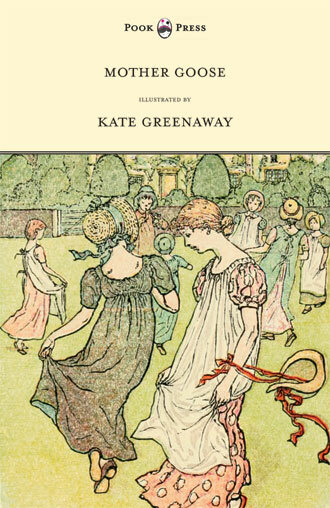 Kate Greenaway, otherwise known as Catherine Greenaway, was born in Hoxton, London, England, on 17th March, 1846. She is world-renowned as one of the best ‘Golden Age Illustrators‘, and brought a new lease of life to turn-of-the-century children’s illustration. Greenaway spent much of her childhood at Rolleston, Nottinghamshire. She studied at what is now the Royal College of Art in London, which at that time had a separate section for women, and was headed by Richard Burchett. 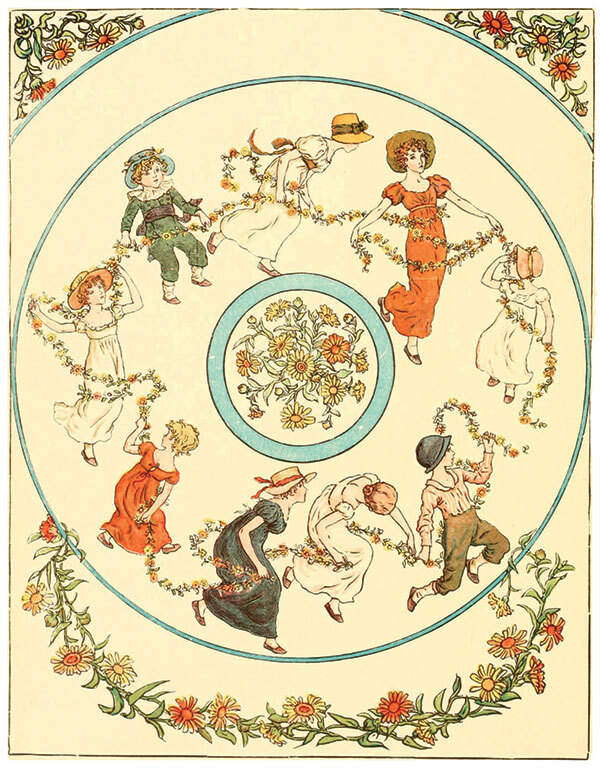 Her first book, Under the Window: Pictures & Rhymes for Children (1879), a collection of simple, perfectly idyllic verses about children, was a best-seller. I was at once fascinated by the originality of the drawings and the ideas of the verse, so I at once purchased them. This was to be the start of an illustrious career. The book sold over 100,000 copies, and started what became known as the “Greenaway Vogue”. 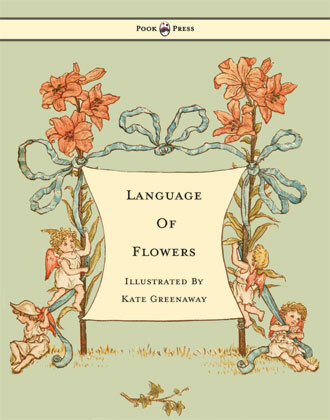 Although Greenaway illustrated over 150 books, Under the Window is one of the only two books that she both wrote and illustrated, the other being Marigold Garden, or the Language of Flowers (1885). After I had engraved the blocks and colour blocks, I printed the first edition of 20,000 copies, and was ridiculed by the publishers for risking such a large edition of a six-shilling book; but the edition sold before I could reprint another edition; in the meantime copies were sold at a premium. Reprinting kept on until 70,000 was reached. 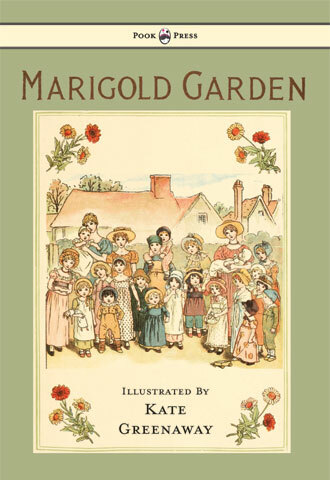 Marigold Garden, Kate Greenaway, 1885. 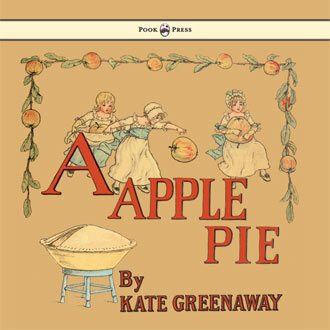 A Apple Pie, Kate Greenaway, 1886. 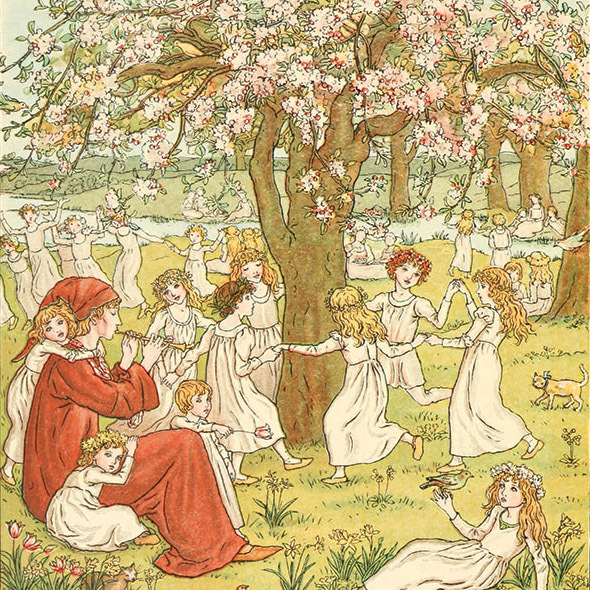 Through the 1880s and 1890s, Greenaway’s only rivals in popularity in children’s book illustration were Walter Crane (1845 – 1915), Jessie Willcox Smith (1863 – 1935) and Randolph Caldecott (1846 – 1886). Her style was truly unique however, and brought such well known stories to life as Robert Browning’s The Pied Piper of Hamelin, Elizabeth von Arnim’s April Baby’s Book of Tunes, the classic old-nursery-rhymes of Mother Goose and Bret Harte’s The Queen of the Pirate Isle. 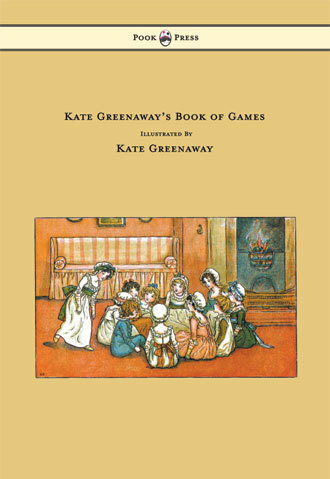 “Kate Greenaway” children, all of them little girls and boys too young to be put in trousers, according to the conventions of the time, were dressed in her own versions of late-eighteenth century and Regency fashions: smock-frocks and skeleton suits for boys, high-waisted pinafores and dresses with mobcaps and straw bonnets for girls. The influence of children’s clothes in portraits by the British painter John Hoppner (1758–1810) may have provided Greenaway with some inspiration – though she was responsible for catching the imagination of the public. By the late-nineteenth century, “Greenaway Children” were so ubiquitous, that Liberty of London adapted Kate Greenaway’s drawings as designs for actual children’s clothes. 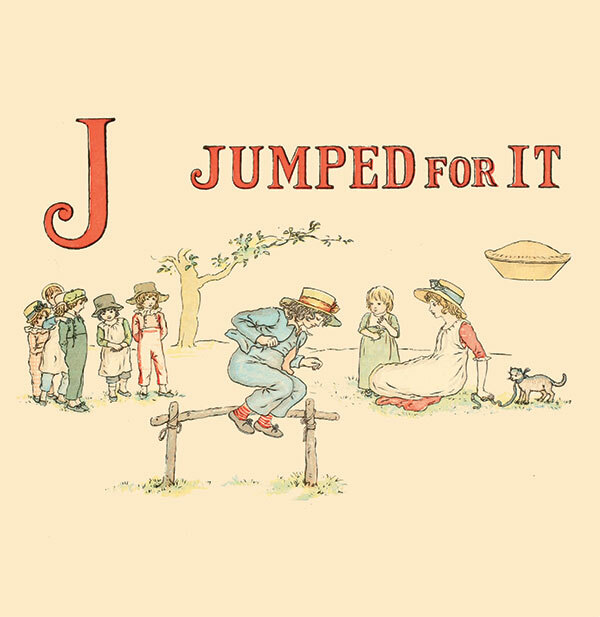 Following on from this, a full generation of mothers in liberal-minded “artistic” British circles – who called themselves “The Souls” and embraced the Arts and Crafts movement – dressed their daughters in Kate Greenaway pantaloons and bonnets. Greenaway’s success was officially recognised in 1889, when she was elected to membership of the ‘Royal Institute of Painters in Water Colours’ in 1889. She lived in an Arts and Crafts style house she commissioned from Richard Norman Shaw (1831 – 1912) in Frognal, London, although she spent summers in Rolleston, near Southwell (Nottinghamshire). Greenaway died of breast cancer on 6th November 1901 – at the age of fifty-five. She is buried in Hampstead Cemetery, London. The ‘Kate Greenaway Medal’, established in her honour in 1955, is awarded annually by the ‘Chartered Institute of Library and Information Professionals in the UK’ to an outstanding illustrator of children’s books. 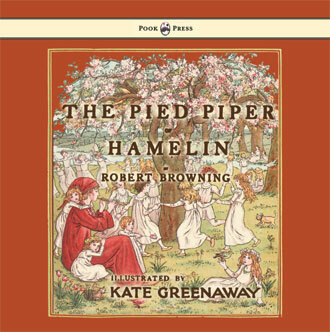 The Pied Piper of Hamelin, Kate Greenaway, 1888. 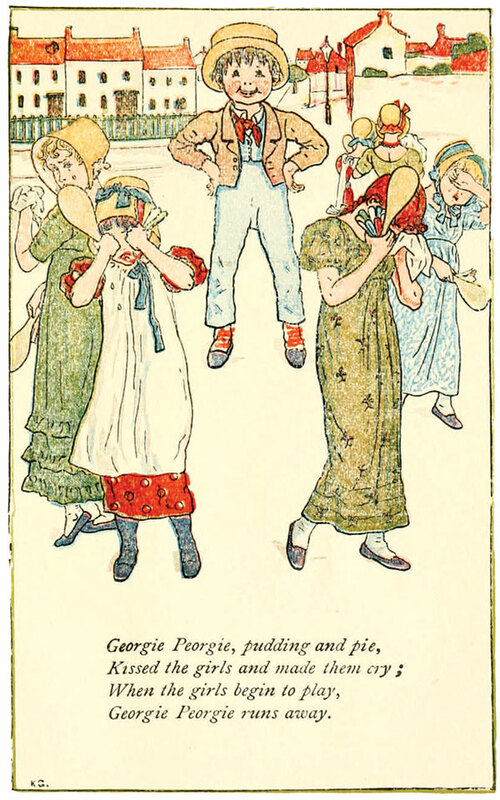 Mother Goose or The Old Nursery Rhymes, Kate Greenaway, 1900.